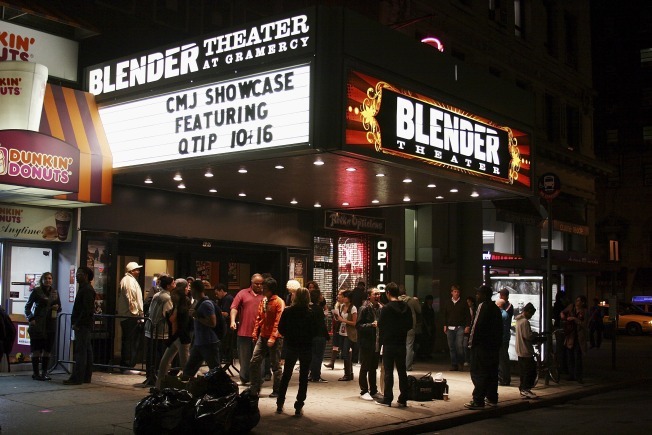 Back in 2007, fans arrive for the Q-Tip performance during CMJ Music Marathon at the Blender Theater at Gramercy. The music rag Blender, a self-proclaimed "ultimate guide to all things awesome about music," looks to be suffering from the same global downward trend in ad dollars as everyone else in the publishing industry. The music blog Brooklyn Vegan is reporting that "the Blender Theater at Gramercy is going back to being just the Gramercy Theatre again," adding that time doesn't look to be on the theatre's side. "This loss of sponsorship is supposedly happening very soon." Depending on how soon that de-blending happens, the Gramercy will have been a Blender-sponsored venue for less than two years. We hardly knew ye! The theatre became a 600-capacity Live Nation concert venue back in late 2006, and has since held shows for acts ranging from Flight of the Conchords to the hip-hop artist Q-tip. An email to Live Nation has so far gone unanswered.